As we all know, the Triangle Bucket List can’t just be about eating delicious honeysuckle sorbets (though that sounds like a tasty bucket list in itself.) It’s about American traditions like Chicken & Waffles, state capitols, and BASEBALL!! Or, in this case, basebull. Diamonds are a boy’s best friend, too! 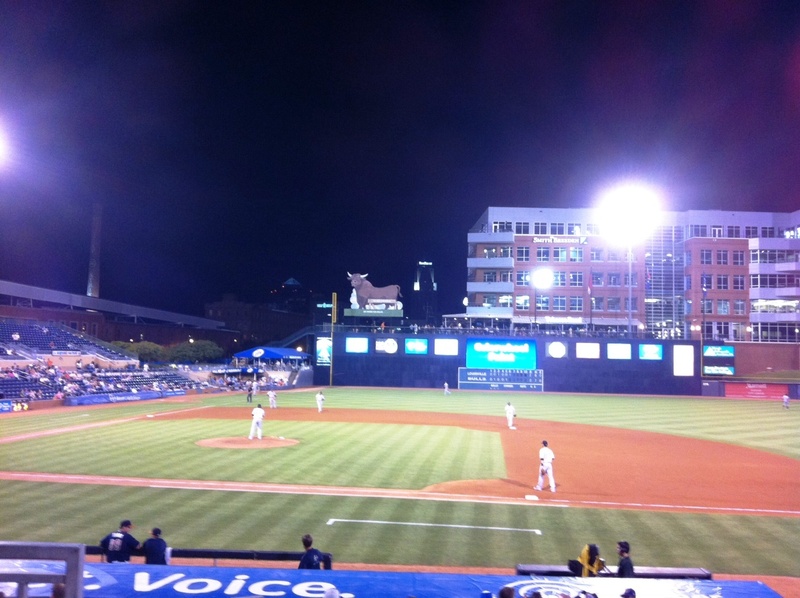 The Durham Bulls are the local minor league baseball team in Durham, NC, and, though I even BOUGHT tickets for a game last year, I’d still never found the time to go. This summer, I knew I had to change that. After checking out the promotions calendar, Melissa and I splurged for a $4.50/ticket Tuesday night game. Deal of the century. 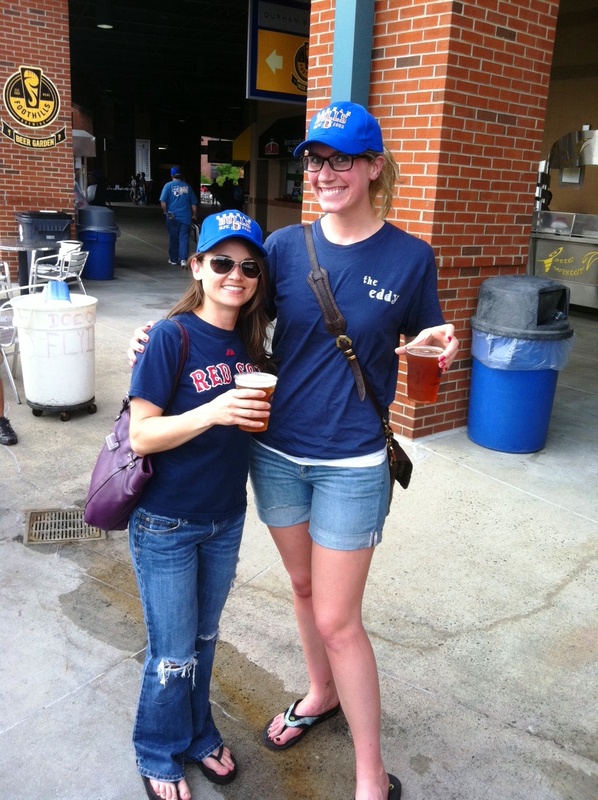 The craft beers at the Foothills Beer Garden were actually more (per beer) than our tickets! But, at $6 a pop, they were cheaper than the $7 tallboys of Miller, and FAR more delicious. And what we spent on brews, we saved on the glory of BYOD(inner). 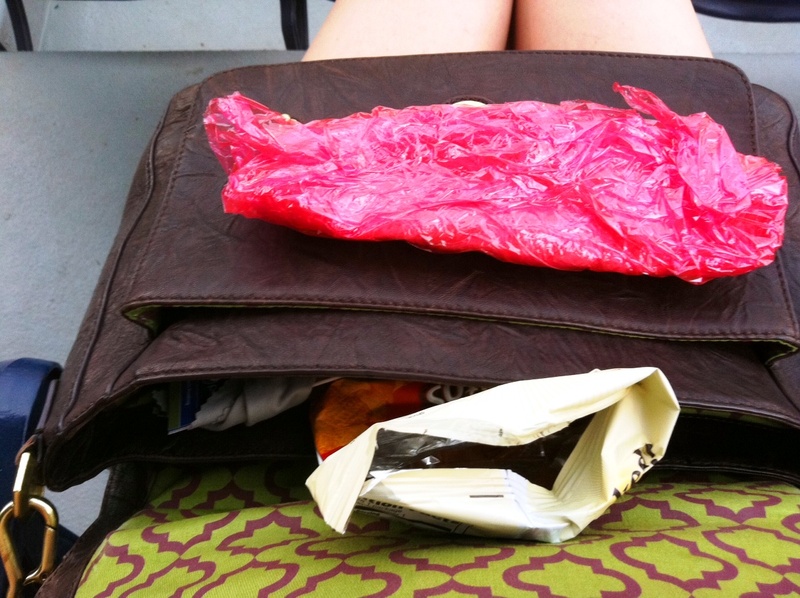 Wrapped up in that gorgeous red cling wrap is tortilla filled with chicken, peppers, low fat mayo, tomatoes, and kale. Very tasty (and very messy.) A side of baked Doritos (mmmmmmmmm) and I was ready for action. Mother nature, however, was looking a little worse for wear. 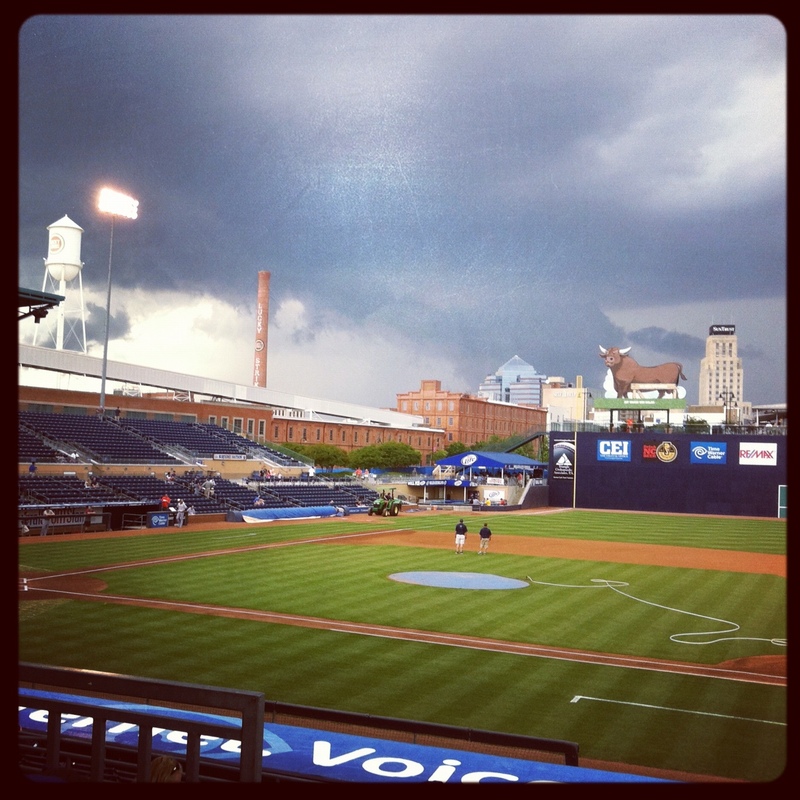 We were definitely nervous of a rainout and, with skies like this, perhaps you can see why. Luckily, before we knew it, she realized that there was a game to be played, hoots to be hollered, and fun to be had. I’ll preface this by saying that, growing up, I had no interest in baseball games. They were boring, they were long, I didn’t understand them, and it was normally sweaty. Well, clearly, I was all wrong. I think I just needed an attitude adjustment. I went into the Bulls game intending on having a BLAST. And that’s exactly what I did. 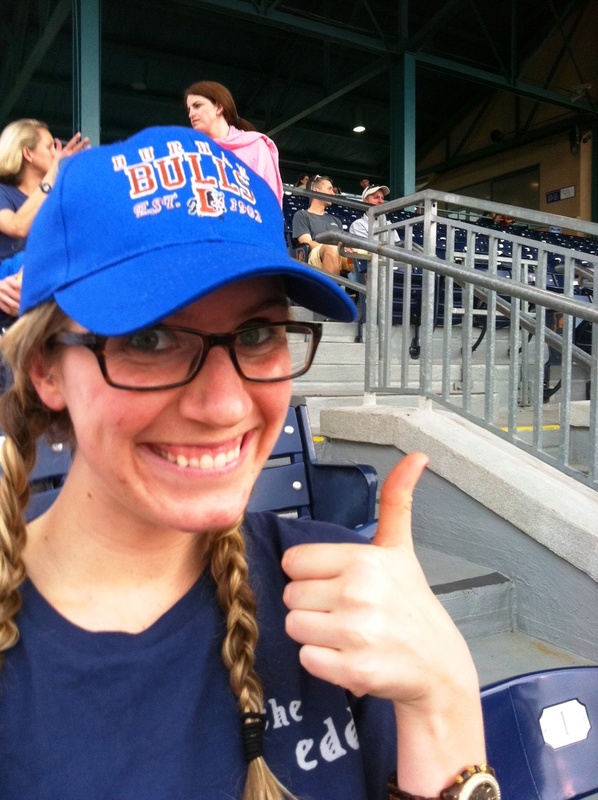 Since we brought in canned foods from Whole Foods, we were graciously given Bulls hats to rock in the stadium. $0.89 for a hat? YES! 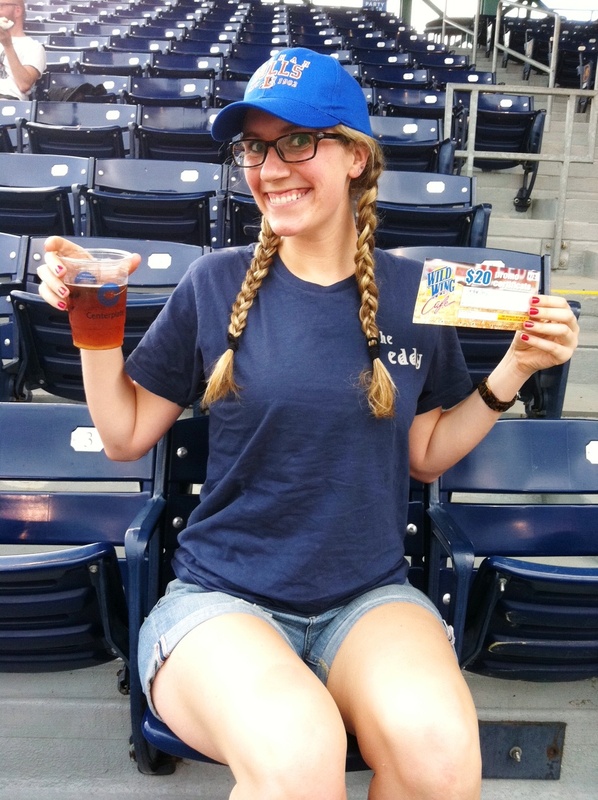 Braids and baseball go hand in hand. Then, due to me rocking the adorable hat, I was randomly plucked from the crowd (of no one, for a while… but it filled up later) as the Wild Wing Cafe fan of the game! You know what that means!! But, apparently, what it meant was that I got my picture taken and received a $20 gift certificate to eat wings! 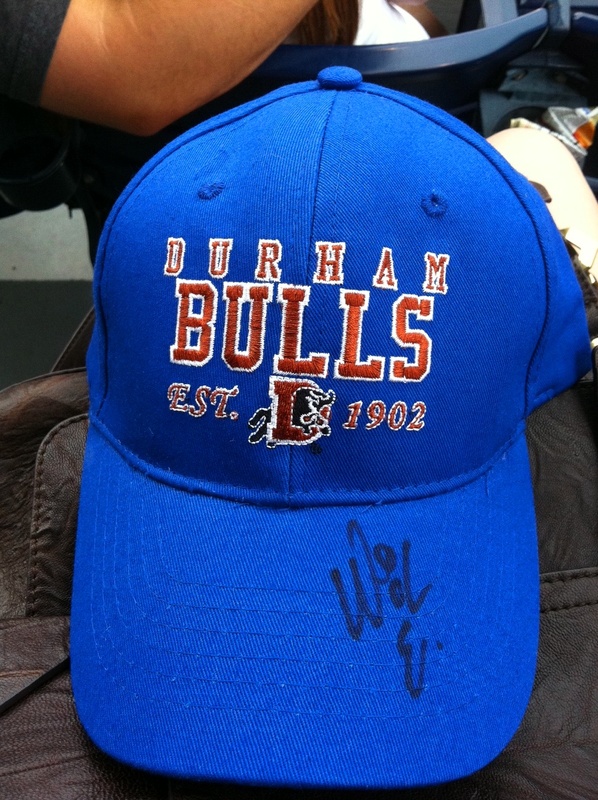 Other highlights included running after a group of kids to get my hat signed by the Bulls mascot, Wool E. Bull, and rocking out on some ballpark peanuts with Melissa. Now the hat is PRICELESS! 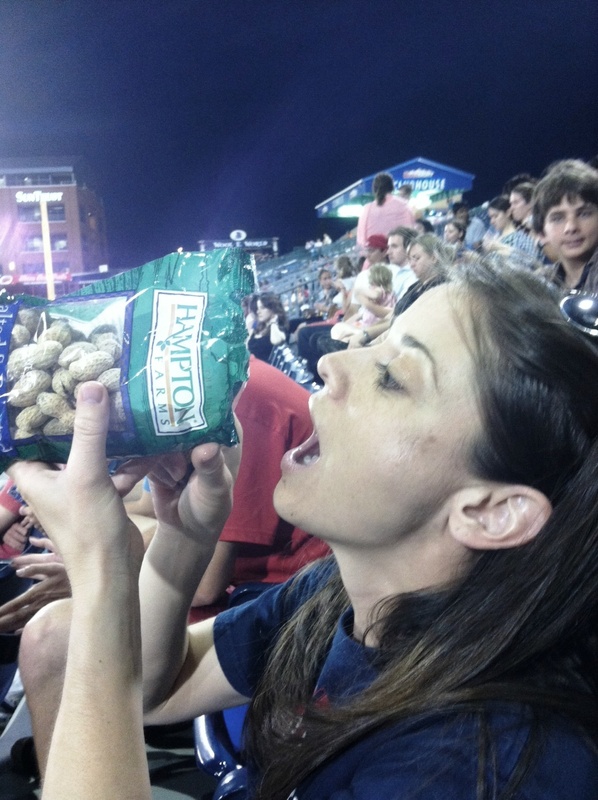 Melissa often gargles with peanuts. Seriously, I couldn’t have asked for a better, more affordable night out in Durham. And if I had kids, you better BELIEVE I’d take them. And then I’d use them as an excuse to run after the players begging for them to sign my baseball. 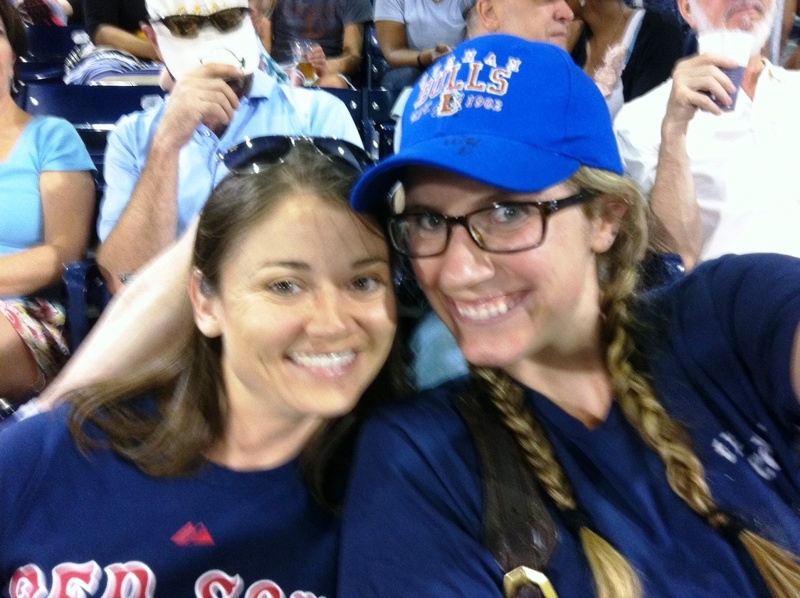 Baseball games: love em or hate em? Though I didn’t enjoy one at this game, I love a good ballpark frank. Maybe next time. I love *going* to baseball games, but hate watching on TV! 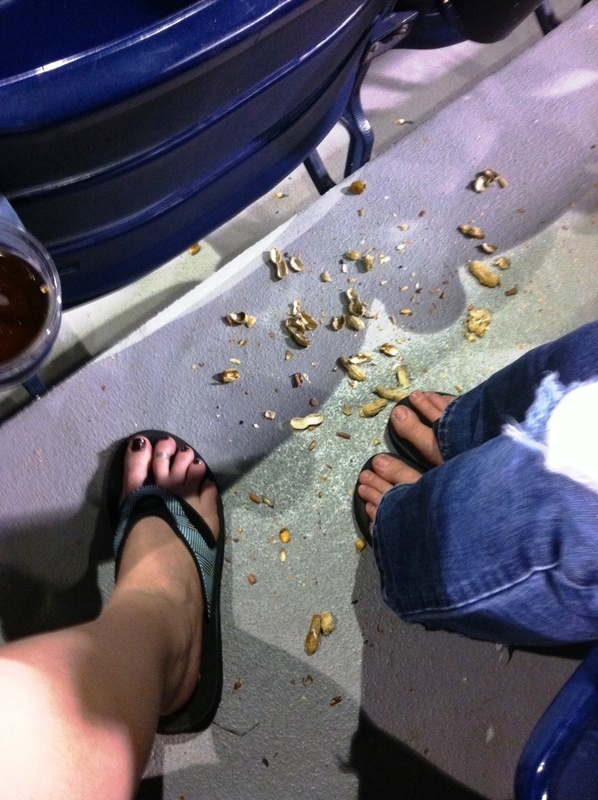 If I go to a sporting event it is 100% for the peanuts! So glad you finally went! I love it so much. They always have great promotions. Did they time the people that groom the field? Did Wool E ride in a golf cart? More like a go-kart. And I don’t think they timed them, but they looked like a well-oiled machine.